Hi and welcome to the humble website of Border Company, home of the Border Bears! 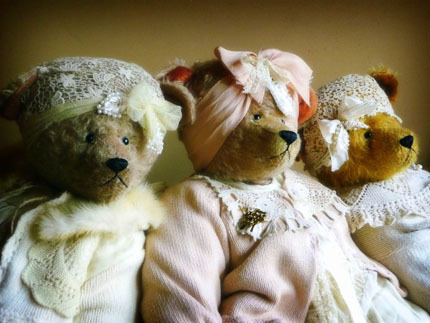 Somewhere around 1990, I found a pattern to create a teddy bear in a magazine and thought it might be a nice idea to actually make a teddy bear. I had made some clothes and interior stuff like pillows, repaired things like the dolls my kids loved. But this proved to be something different, as I really enjoyed shaping a personality out of fabric and threads. As you can see, a hobby became a job and I started my own little company. I attended fairs to share my creations and now some of my bears have travelled to other continents to see the world! All my products are hand made and one-of-a-kind. You will never see two of the same Border Bears. This is because they are all hand-made and are often made of fabrics you don’t find so easily. Some Border Bears might be more or less the same model (because they are based on the same pattern), but they will be shaped differently because of the padding and (hand) molding during production. Also, much of the material I use to create the bears, are genuine and might even be used. 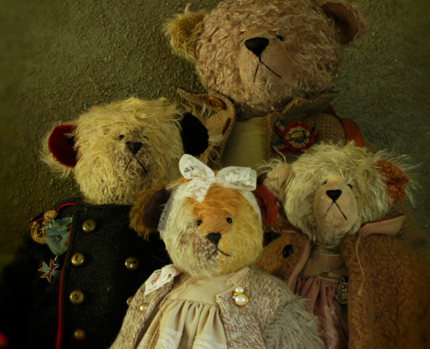 This way, the materials are not only given a second life, but they give each bear a carefully crafted identity because of the past they carry with them. Not only in their clothing but in their skin as well! Take note of this when viewing these pages: if you see one bear you like, it could be sold the next moment because there is only one in existence! And if you are lucky to adopt one of my bears, please take good care of it!